There is no child in the world who does not wait for Christmas. But how do the children of Bethlehem live it, the city where Jesus was born? “Even today, an angel has arrived in this house. Thank you so much!”. 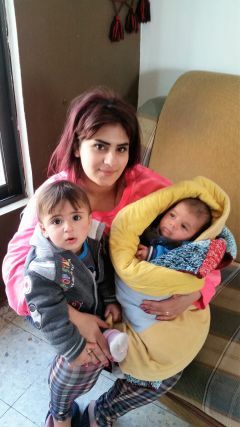 Hana, 22, has just received from us a month’s voucher to buy milk for her little Aram, who has just been born. Hana is moved and finds no words to thank us. Together with her husband and her two children, she lives a few steps from the Basilica of the Nativity in Bethlehem. “Every day – he continues -, I pray God from this window and, through you, He has helped me once again”. In fact, up until a week ago she and her husband were very worried, because despite their hard work, they did not even have the money to buy the necessary for the maintenance of their children. “Imagine new clothes or toys”, adds Hana. “Today, however, we can again experience the hope of Christmas and discover once again that we are not alone. So thank you “. Like many other families, even that of Hana and Aram is assisted by Association pro Terra Sancta in this “milk campaign“, through the FSSO (Franciscan Social Service Office), the Franciscan caritas that every week hears and welcomes the requests of many families in need of Bethlehem, who experience great discomfort due to the social-political situation of their land. 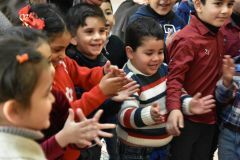 Together with the little Aram, it is also Christmas for Mariam, Nadir and Bishar, the only three Christian children who attend the kindergarten of Franciscan missionary sisters in the refugee camp of Aida in Bethlehem. With them many other children of Islamic faith sing A salaam, the refrain of a famous Arabic Christmas song. “Salaam in Arabic means ‘peace’ – says Sister Luis – and that’s what these children want most of all for Christmas. They breathe violence more than everyone and especially in this period suffer from the situation. Look out here, this wall, it’s depressing! But sometimes just a little gesture of help, a caress and a prayer to see them smile, to bring the joy of Christmas “. 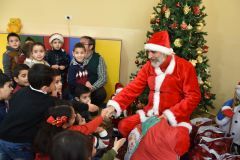 A small gesture that today, at the nursery school in the refugee camp of Aida, arrived with a visit from Santa Claus! Yussef, however, like many of his peers is waiting for the Christmas holidays and these days is studying hard before the closure of schools. 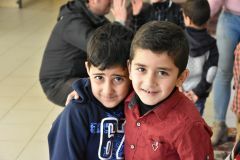 Thanks to a donor who has joined the Distance Support project, he has the opportunity to serenely attend the third elementary school of the Terra Sancta School, the Franciscan institution that only in Bethlehem receives 1170 boys. “For eight years I lived in the old city – says Yussef among his dear books – but then mom and dad could not find work anymore and they fell into depression … There were so many problems at home and I could not stay with them anymore”. Today, Yussef lives in the beautiful Casa del Fanciullo of the Franciscan friars, who together with him host many other children afflicted by family problems. His parents are also followed by the Franciscan social center and he is serene. 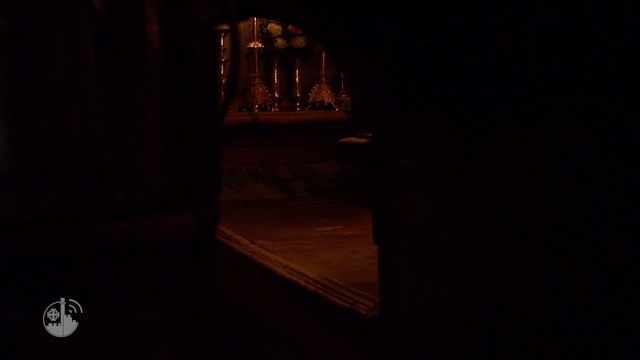 Even if “I miss my old house – he says – I know I am very lucky: I still live near the place where Jesus was born and this gives me so much hope. In a few days it will be Christmas and I hope to receive some books because I like to study and when I grow up I would like to be a doctor, to help those who live a great suffering, like my parents “. Many other children of Bethlehem, due to disability or chronic illnesses, will not be able to celebrate Christmas with their loved ones or companions, like those of the Hogar Nino Dios, the structure that houses children suffering from serious psycho-physical illnesses. Even for them, a stone’s throw from the Grotto, as well as Aram, Mariam, Nadir, Bishar and Yussef, Christmas will come thanks to help and support. And at Christmas they too, like all children, will be able to rejoice for the birth of Jesus, who has chosen that place as his first home. At Christmas, support the children of Bethlehem too!